Millions of people visit the greater Gatlinburg area every year, so traffic can be a bit of a problem. Traveling in the early morning or late at night will give you the lightest traffic, but as we know first hand, it doesn't always work out that way. There are alternatives if you've got a mobile phone with Google Maps. The mountain back roads may seem intimidating at first, but just take your time, enjoy the view and take in the peaceful tranquility of rural Tennessee. Back roads are clearly marked and the directions are easy to follow! 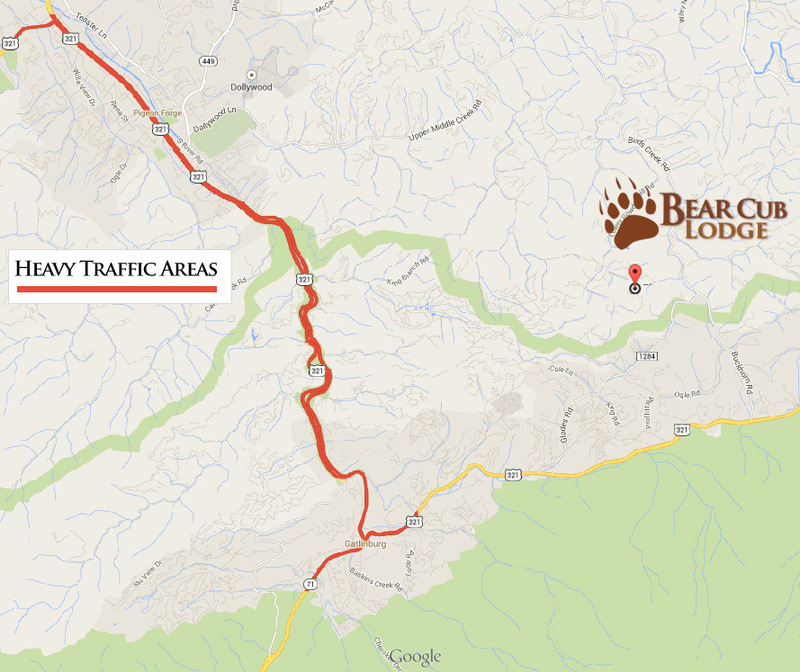 Below are links that will guide you to the cabin the "back way" and avoid all of the tourist traffic of Highway 321. Knowing the back roads is key to getting to your destinations in a timely manner. When we travel by car around the area, we try to stick to the "local" routes as much as possible. Count on at least an hour from Interstate 40 on the north side or the East side. If you decide to go through Pigeon Forge, depending on the time of year and time of day, you could spend more than 3 hours getting through the traffic. You'll want to take the route that goes clear through Severville, DON'T take 321 unless you are going somewhere specific before the cabin. Here is a link to a map of the route we always take when coming from Interstate 40 to the North. It is much faster to come into Gatlinburg from the East than it is to go through Pigeon Forge. If you are coming from that direction, we recommend taking TN 339 (Foothills Parkway). The scenery is fantastic, and it brings you right into town via 321. There are several spots to pull off for great photographs. Here is a link to that route.